I grew up in an around an Italian restaurant kitchen, so when my parents would take my sister and me to an “American” restaurant, the chance to get a hot dog or hamburger was the thrill of a lifetime. My sister and I had very different taste in food. She was a hamburger, tootsie roll and orange soda gal. I always went for the hot dog, red licorice and root beer. While burgers bored me, I noticed that I would always lose interest half way through the hot dog, too. Maybe it was just too much of the same thing bite after bite. Now if we were offered the Pepperoni Pizza Burger back then, I would have changed my allegiance immediately! This burger is just downright delicious. The ground beef and Italian sausage is always a winning combination, especially if it’s hot sausage. Very little else is required; some Italian seasonings and salt and pepper. What makes this burger so yummy is melted cheese and slices of pepperoni. Also, the bun is toasted in a skillet with butter and then slathered with marinara sauce and a sprinkling of grated Parmesan cheese. 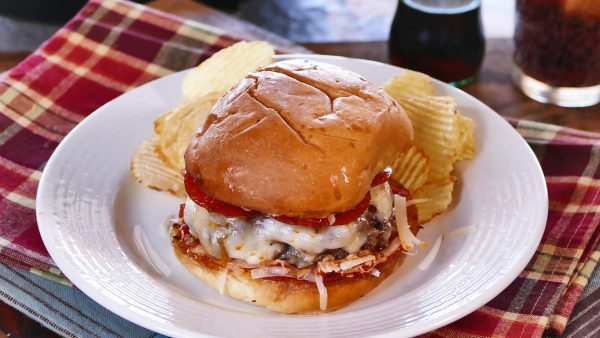 I think this Pepperoni Pizza Burger puts a tasty spin on an old favorite and certainly serves up a big portion for a big appetite! Watch my How To for Pepperoni Pizza Burgers here! Jan’s Note: I was thrilled when I came across a very tasty Turkey Pepperoni this week. The brand is Bridgford, found in the packaged deli meat section of Bashas’ Grocery Stores. Yum!